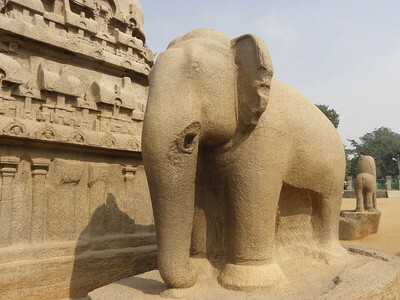 The Group of Monuments at Mahabalipuram consists of temples and reliefs from the 7th century Pallava-dynasty, known for their sculptures carved out of rock. Mahabalipuram was a seaport of the South Indian dynasty of the Pallavas, before they lost power to the Cholas. The bas-relief “Descent of the Ganges” (also known as Arjuna’s Penance) is considered to be a unique artistic achievement. The sculptures of Mahabalipuram have influenced those in Cambodia, Annam and Java. Mahabalipuram is a great place to start a journey through (South) India: it’s a small relaxing town that comes with a pretty good WHS. I visited the groups of temples and other carvings around town in one morning. Already at 7.30 am I walked to the Shore Temple – I had set out early to beat the heat and the crowds. But I surely wasn’t alone: dozens of Indian pilgrims clothed in red robes were already coming back from a bath or an offering in the sea. The entrance to the Shore Temple is separate from that to the beach, and it’s here where you’ll have to pay the 250rs entrance fee (valid for all sights in Mahabalipuram). This Shore Temple is the most recent of the Pallavan constructions. It did remind me a little of another WHS, Prambanan on Java. Unfortunately most of the sculptures at the Shore Temple have faded beyond recognition, due to erosion from wind and water at its location near the sea. While admiring the structure, I was ambushed by groups of girls who wanted to talk to me or take a picture. I had thought that the 21st century would have ended this curiousness here in India too, but it hasn’t (men often just stared and stared…). Right in the middle of town, 5 minutes on foot from the Shore Temple, lies the bas-relief “Arjuna’s Penance”. This is a sight that immediately captures your attention – such an elaborate and huge sculpture! This is rightly singled out in the ICOMOS evaluation too, as a “unique artistic achievement” and highlight of Asian art. The sculpture fully covers one side of a rock, and is made up of lots of single scenes. Finally I walked to the Five Rathas, at the other end of town. These temples were cut out of one boulder, an impressive piece of work. However I liked it least of the main sites. Its best features are the large stand-alone statues of animals: a lion, a bull (Nandi) and an elephant. I visited Mahabalipuram in the first day of my visit in India in March 2015. I went there by taxi from Chennai airport (approx. 2200 INR for return trip to the city center), but there is very good system of cheap public buses from Chennai. The site itself was nice but, comparing to other WHS in Southern India, not so deligthful. The sites is not big, but there is some distance from Shore Temple to Five Rathas. The latter I liked the most, especially because there were a lot of school children in uniforms, running and climbing the stairs and statues. The surroundings of the Shore Temple were, to my regret, not so beautiful and the beach was full of litter. I have always seen the monuments at Mahabalipuram with great awe, realising the immense talent that sculptors of that era possessed. As an Indian, I would like to preserve them from further deterioration, due to environmental and human factors. This site should be protected from visitors, who are allowed touch all the monuments. Visitors are allowed to touch the sculptures, which is damaging by time goes on. Please take necessary steps to stop monumnets getting damaged by visitors. This heritage site around 50 k.m away from my home. I am very much excited to visit this site every time I go there. It was so ancient that makes me proud of being part of the heritage land. Since this site is situated near sea coast, it will be a great pass time to be there. I remember my ancestors when I go their, particularly my grand mother who is no more now.